I always had just 2 piercings, the standard earlobe ones. Then I decided to get another one. I was thinking of getting a second lobe, but I saw a picture of Riri’s piercings and I loved her tragus piercing. I got one on my left tragus and I personally think I made a lot of mistakes, mostly due to lack of information. Tragus piercings are particularly different because the tragus is made of cartilage. I wrote this post to share my experience, especially Dos and Donts when dealing with this. 1. Get your tragus(or any other part of your body) pierced by a professional in a clean place with the right equipment, ensuring they do not reuse things. 2. DOES IT HURT? This is the most commonly question I get about this piercing. It really depends on the thickness of your tragus and the experience of the piercer. Also, some people have really soft traguses while others don’t. My tragus was quite thick, so it wasn’t the least painful process. You could apply lidocaine gel 3-5 minutes before to numb the area. 3. After the piercing, do not touch the tragus for about 1 week or change the earring for about 4-6 weeks. You can apply shea butter or saline solution to it twice a day to prevent the earring in it from getting stuck. When you play with it or remove the earring often(in the early stages), it inflames/irritates that area and can cause infection. That was exactly what happened to me. 4. I used an antibiotic ointment for a period of time and it resolved. Please see a doctor if this ever happens to you. 5. At this point, I was just really tired. So I left the earring in it(it was Swollen at this point) and kept applying the ointment. Keeping the earring in place creates a path for the discharge instead of sealing it in and causing further complications. I stopped fiddling with it and after some months, my tragus was back to its normal thickness. Normal healing time is about 2-4 months. 6. Always wash your hands or use hand sanitizer before changing your earring. 7. Tragus piercings close quite easily, it’s best to leave the earring inside most of the time. 8. Don’t be discouraged. If you want, do it. I still think it is the most beautiful ear piercing. Plus I’m the only one I know who has had this experience with it. Consult a doctor if you notice redness, soreness, continued bleeding, yellow or green discharge or a foul smell coming out of the pierced area. 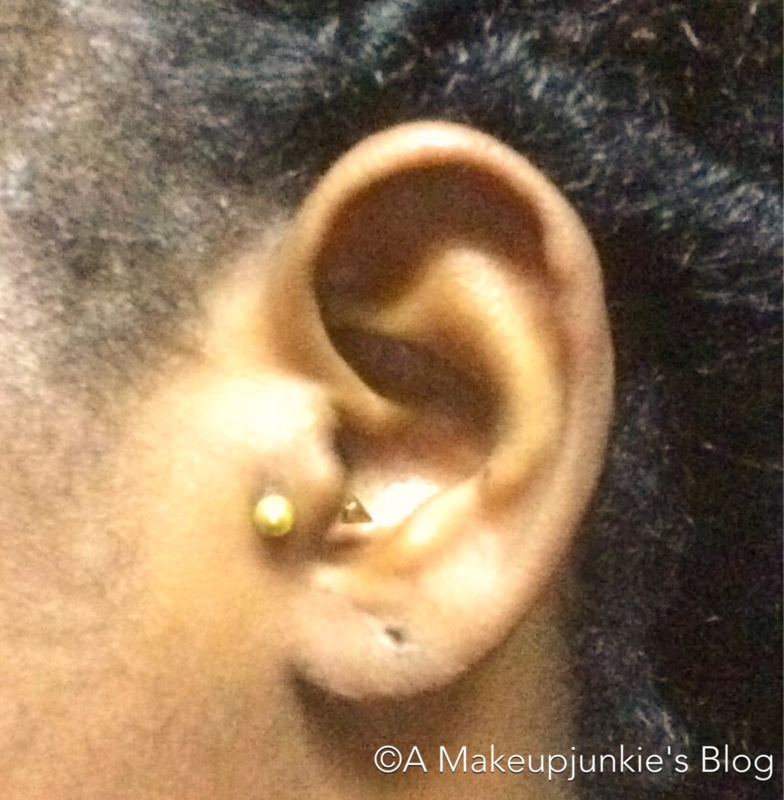 Have you had your tragus pierced? What was your experience like?? If you haven’t, what questions would you like to ask??? I’m not a piercing specialist, but I’d love to discuss with you…Leave all your comments/ questions below!! • You can follow me on social media: @amakeupjunkie_ on Snapchat, Instagram, Twitter and share my posts to your friends and family! Been wanting to get this piercing for a long time now but fear and pain!!! 😥😥😭😭😭 very enlightening post! I know the feeling…if I want it, do it. If you end up not liking it, it’ll close up. It’s best to wait then so it heals properly. I’ve been wanting to do this for a while but most piercing places I know in Lagos use the gun and from experience that’s not the best. Was a gun used for your piercing? Lavender oil also works beautifully for piercings (it’s saved my nose piercing so many times) great post! I did mine at Bismid and they used a tiny earring(those baby earrings). Guns aren’t the best for a number of reasons, especially infection. What purpose does lavender oil serve? I haven’t had my tragus pierced but I did have my rook pierced. Cartilage piercings are very fiddly to handle and sometimes get inflamed and infected. I have found that doing a sea salt soak really helps to clear that infection. It also helps to speed up the healing process! I don’t I’d heard of the sea salt soak before now..That’s great to hear. My piercing is healed now, but just in case I get another one. Your piercing is healed? Wow that was quick! How long have you had it? I’ve had mind for about 7 months and from time to time it flares up and acts crazy but it definitely doesn’t hurt or anything at all. Have you switched out your earring? I’ve had mine for about 9 months and it’s healed now. Yes, Ive switched out my earring a number of times. I’ve even left it for days without a earring in. I just apply coconut oil and try to clean it and it’s been doing well so far. Whoa that’s so cool. I’ve never switched out my earring but I’m looking to replace it with a cooler one soon. I’ve never thought about using coconut oil, I always thought it would irritate it. I will definitely try that soon. How do you clean it? I apply just a little coconut oil… I use a cotton pad soaked in warm water to clean it.